In spring of 2014 artist James Esber was interviewed by Skidmore College students Rosie Dienhart ’14 and Talia Steinman ’14 about his work Bouquet, 2004, in the exhibition One Work. James Esber makes paintings and drawings that twist and distort familiar images in American culture. Esber has long been fascinated with how the brain and eyes respond to optical clues, particularly the point at which a distorted image ceases functioning as a representation and turns into something new. He searches the Internet for images and, using Photoshop, manipulates the forms, which he then transfers to paint and other materials. 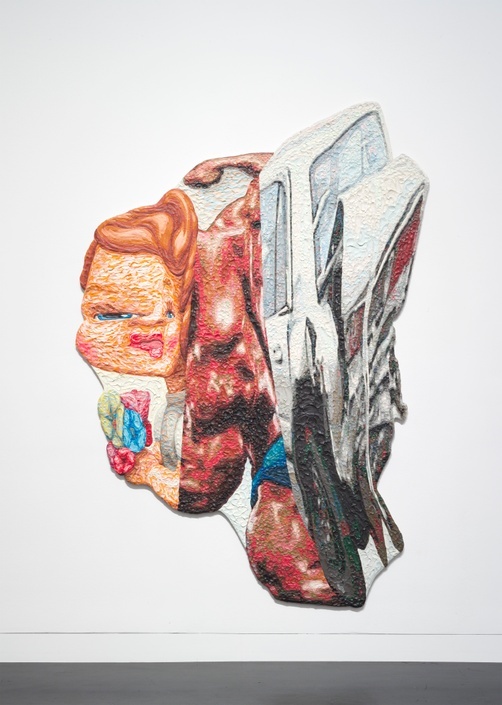 Some works feature a single image, while others present a riotous mashup of disparate images: heroes and villains such as Abraham Lincoln, Michael Jackson, and Osama Bin Laden, or, a range of kitsch, like the Hummel figurine, body builder, and smashed car in this work. In the late 1990s, Esber began experimenting with Plasticine, a type of oil-based modeling clay. The maleable material is applied in hundreds of small patches, creating an undulating relief that emaphasizes the plasticity of his forms. Esber, James. “James Esber on Bouquet, 2004.” Interview by Rosie Dienhart and Talia Steinman. 2014. Tang Teaching Museum collections website, last modified October 19, 2018. (https://tang.skidmore.edu/collection/explore/34-james-esber).